Sunny Wilmington, North Carolina was not the city where FC Montreal would pick up its first point of the 2016 United Soccer League season. Goals by strikers Qudus Lawal and Matthew Barnes Homer, sunk the visitors as FC Montreal lost 2-0 to the Wilmington Hammerheads. Montreal started with strong winds blowing in their faces. This meant that they couldn’t send aerial passes to each other and goalkeeper Maxime Crepeau couldn’t get a goal kick out. The Hammerheads didn’t wait very long to get on the scoreboard. As early as the sixth minute, a poor pass by Montreal centre-back Jems Geffrard was intercepted at the middle of the pitch and the ball was immediately sent to Lawal for a breakaway goal. The first half struggle continued for the bleu-blanc-noir, Wilmington controlled the pace of the game for the most part of the half. They tried to get a second goal in but did not convert and lost Lawal, one of their best players of the half, to injury at the 34th minute. 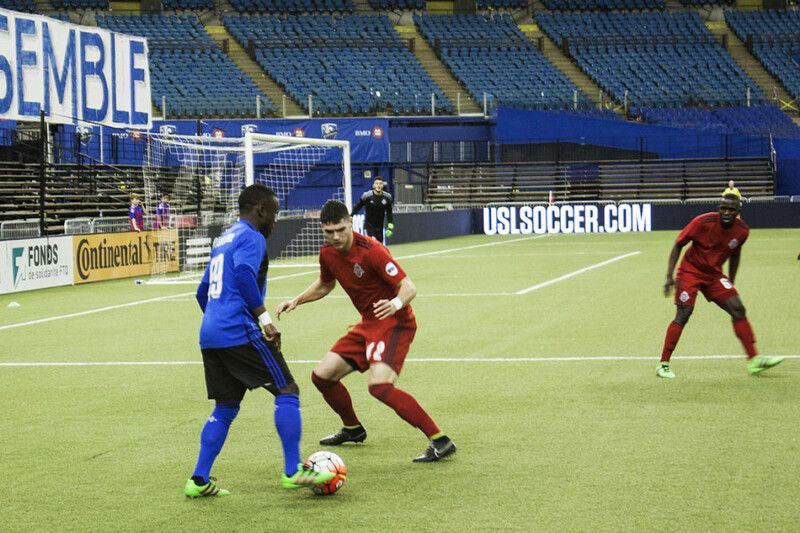 Coming back from the locker rooms for the second half, the Hammerheads continued their pressure on Montreal. At the 59th minute, defender Michael Mecham sent a cross from his right flank towards Barnes-Homer who headed the ball past Montreal keeper Crepeau and securing the win for Wilmington. With three games played in the 2016 season, FC Montreal has failed to record a single point yet with a 0-3-0 record. With the result, Wilmington found their first home win of the season after having drawn the Richmond Kickers on April, 1. Montreal are now one game down from their five-game away stretch. Head coach Philippe Eullaffroy’s squad will try to find their first points of the season against long-time rival Rochester Rhinos in up-state New York on Saturday, April 23.